Please email your text & logo (If Required) upon placing order. Promote Your Club, School, Sponsor. A High quality printed sticker. You can have your Club name on one side & a sponsors name on the other the possiblitys are endless. 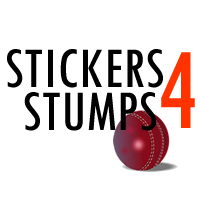 Stickers 4 Stumps will add life to your stumps offering protection; they can be applied to new or old stumps with no fuzz & no hassle.